"Breathprint": Your exhalation could help doctors diagnose you. Photo by Xue Li/Christine Khammash/ETH Zürich. Most of us consider human breath only when it’s clogging up our airspace. But there’s more going on in there than a bunch of bacteria producing foul-smelling sulfur compounds. Your body jettisons all sorts of interesting molecules with every breath—compounds that can vary with the time of day or the ebb and flow of microbes in your gut Now a new study shows that despite these variations, regular testing of breath can be used to establish an individual “breathprint” for each person, potentially unlocking a faster, less-invasive way to test for trouble within. 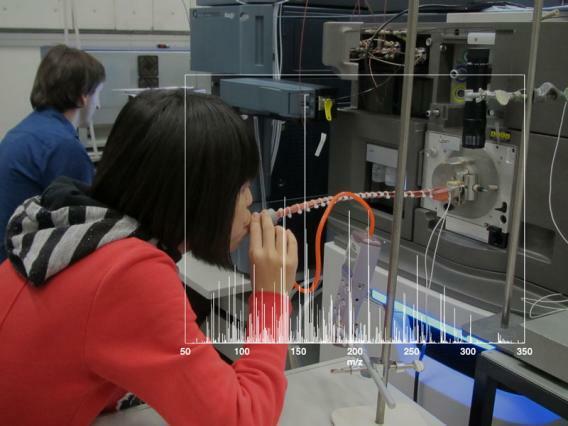 In a new open-access, peer-reviewed study out of ETH Zurich and the University Hospital Zurich in Switzerland, researchers had participants breathe into the business end of a modified mass spectrometer four times a day for 11 days. Participants had to refrain from eating, drinking, or brushing their teeth for half an hour before blowing. (No smokers allowed.) Interestingly, the scientists used data only from the last few seconds of each exhalation, as the first few seconds of any breath is mostly the “dead volume” in the upper respiratory tract. (Perhaps this isn’t so surprising, as other biofluid tests—like urine pregnancy tests—recommend you pull a sample midstream.) Each person yielded a stable “breathprint” over the span of eleven days. Which means beneath all our varying odors of garlic, coffee, and artificial spearmint, there lies a matrix of regular, detectable compounds that scream, This is my stink! There are many like it, but this one is mine! Divining the secrets of the human body via breath isn’t a new idea. The breath of diabetics sometimes smells noticeably fruity, thanks to the presence of acetone. In recent years, researchers have also had success identifying exhalation compounds linked to multiple sclerosis, drug use, and kidney disease. In Germany, another study revealed that dogs could sniff out lung cancer on a patient’s breath with surprising accuracy. While cancer-sniffing dogs sound amazing, they make bum lab partners. Or as the author of the study, Thorsten Walles, put it in a press release, “It is unfortunate that dogs cannot communicate the biochemistry of the scent of cancer!” The other diagnosis-by-breath studies, at least, can identify telltale molecules and then test specifically for them. The Swiss team is now looking to use similar methods in conjunction with their breathprint to create better tests for nasty diseases. Recently, personalized medicine has become the topic of buzz, but genetics are just one piece of the human puzzle. The Swiss paper points to other factors affecting our health like lifestyle, interplay with gut microbiome, and circadian cycles. If researchers were able to better map a person’s metabolome—the mess of 2,500 metabolites, 1,200 drugs, and 3,500 food components known to sometimes exist in the human body—it would give us another crucial piece of the puzzle. For those fighting cancer or the chronically ill, breathprints could one day mean fewer blood-sample-pinpricks and inconvenient urine samples. Combined with genetic testing, those who are healthy but predisposed to certain diseases may be able to undergo regular breath testing to watch for warning signs. It’s enough to take your breath away.